Please call 911 if you are in danger or experiencing a life threatening emergency. CyberTipline for reporting the exploitation of children. Children and adolescents in crisis will receive immediate help. substance abuse, family counseling, residential care, adoption/foster care, etc. Provides crisis intervention and travel assistance to runaways. Gives referrals to shelters nationwide. Also relays messages to, or sets up conference calls with, parents at the request of the child. Has access to AT&T-Language Line. Separate Hotlines for Adults and Youth. Provides information and literature on mental illness by disorder-for professionals and general public. Provides referrals to local facilities where adolescents and adults can seek help. This page contains referrals related to crisis issues such as domestic violence, suicide and child abuse. Other topics include low-cost counseling services, substance abuse and recovery, lesbian & gay services and parenting. 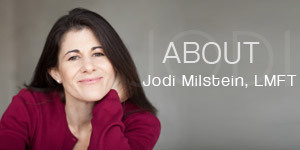 Jodi Milstein, MA, LMFT and www.RockStarTherapy.com are not responsible for the content of the above listed sites. www.RockStarTherapy.com does not accept paid advertising of any kind. However, clicking on any of the above listed links may lead you to sites which do accept paid advertising and collect your personal information.